If you love travel, The Traveling Fro, by Jakiya Brown, is an absolute must-follow. Check out the incredible story of how she gave up her 9-9 job to follow her passion. A little life inspo for us all. What's the story behind Traveling Fro? Growing up in the South, as 1 of 2 children of a single mother, my path was go to school, get amazing grades, go to college and land a great paying corporate job. I did all of that. Then I soon realized what I was doing, I wasn’t passionate about it. The fire and the drive was gone. I was going through the motions, not hating what I was doing, but feeling a deep sense of there is something else out there calling. Something that makes me love and appreciate life even more each day and makes me really feel like I’m alive. That was travel. I didn’t know how I would do it, but I knew that my life would be centered around traveling to new places, experiencing new things and making lasting connections. The Traveling Fro was started as an outlet to share my travel journey and to inspire others around the world to follow their dreams too, whatever they are. How has being a digital marketer elevated your Instagram game? Being a digital marketer has completely changed the game for me as far as Instagram. Coming from the brand side I was able to see what brands look for, what they pay and how the operate. However, it isn’t that simple, I had to find my voice, be consistent and really connect with my audience those are the intangible things that don’t come with marketing experience but are learned along the way. So many people; of course, my Mom, my Grandmother, and my family. But what really inspires me are everyday people that see themselves in me and are motivated by what I am doing, that truly inspires me. The world is the biggest source of inspiration. There are so many things to do and see. The beauty in even the little things inspires me to keep doing what I am doing. What's your favorite city/country you've ever visited? This is probably the hardest question I get. I cannot choose just one place. There are so many amazing places in this world unique in their own way. My favorite places are the ones I haven’t been to yet. There is something so amazing about not knowing what to expect when traveling somewhere for the first time. One of my favorite feelings is landing in a new foreign place for the first time. You can never prepare yourself for that moment and you can never get it back. Once you know a place that feeling is never the same. What's a city/country is still on your bucket list? So many! Bali for sure, India, Zimbabwe, Vietnam, Rwanda. What are your must-have items in your carry-on and why? What's your favorite international cuisine and why? Any fresh seafood, with a glass of wine. When I was in Portugal for a few weeks this was my go to meal. I didn’t think seafood could get any tastier until I got to Senegal. Fisherman catching your fish and shells each morning, with a side of aliko (sweet plantains) and rice, there is nothing better! Her asthetic from the colors, editing her style is just amazing. They ways she visually story tells her love for Africa keeps me coming back each and every time. In case you couldn’t tell I am obsessed with all things Africa, and this account displays it all here. Partnering with local tastemakers and curators to display Africa in the light it should be, positively and full of life from cuisine, to fashion they highlight the cool, creatives and travelers on the content. Making it even cooler and more trendy to visit Africa. Simply because she inspires me. She was one of the first curly haired black women I saw traveling to places like Haiti and Guinea solo. Things that I had always wanted to do but didn’t know how. Her instgram is so inspirational not to mention visually memorizing. The fact that most of her photos are taken by randoms (because she travels solo) is the best part. 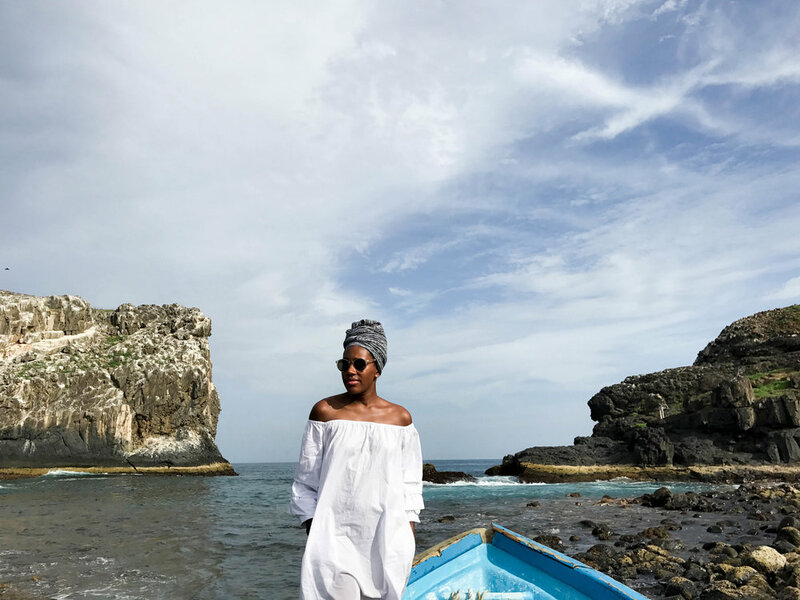 I can relate to her travels in so many ways and admire her wanderlust soul making African travel look so effortless, when most of the time it is everything but. I am so over the floppy straw hats with writing on them, and the girl looking up with her back turned and hand on her head. Like how much less creative can one get? Ready for that one to die for sure. Pretty much anything that is repetitive. I love people who create their own unique content. Sure you can use others for “inspo” but do it in your own unique never been done before way. FAITH OVER FEAR. It is my travel and life mantra. It gives me the courage to do anything. Face my fears, put them to the side and just go after it. It truly keeps me going. Whenever I face down moments, doubt myself or face fear I repeat this to myself; every flight, every new country, every new scary but exciting thing that comes my way.